So if you follow me along through this review, I’ll be letting you know what I feel are the good and bad points (and believe me when I say there are things which I wish were done better), and letting you know why I ended up switching to it from Clickbank. Hint, it involved me doubling my profits through a mix of fee savings, order form bumps, and increased conversions. Lastly, I’ll give some videos so you can see inside of Thrivecart yourself, and decide if it’s the right shopping cart for you. So let’s get into it. You can use these links to skip to any relevant sections of this guide. Thrivecart Lifetime Discount Deal And Pricing, How Much Does Thrive Cart Cost? Thrivecart Vs Samcart Vs Clickfunnels, Which Is Better? I think it’s important for me to give some context about who I am and how I’ve used Thrivecart in my business. This is so you can see I’m using it in a real business which generates profit on a daily basis. First of all, I’m using Thrivecart on my website Music Industry How To. 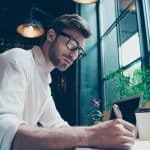 At the time of writing, this is the world’s biggest music marketing advice website, and generates over 200,000 page views per month. 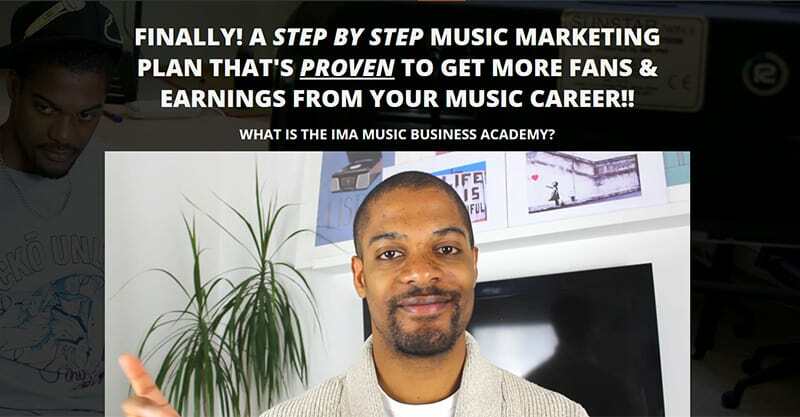 I use it to sell multiple products on the site, such as my online music marketing course (you can see the page with the Thrivecart form example here). Payments go through my Thrivecart software every day, so know that I’ve tried and tested it and can give an honest review. Ok, so now you know why I can credibly show you my true feelings about this tool (and that I’ve used it enough to give an accurate judge on how good it is), let’s look at what I like and dislike about Thrivecart. Before we go any further, let’s look at what Thrivecart is. In short, it’s a hosted shopping cart which allows you to take secure payments for any digital goods you sell on your website. What makes this one different from your average shopping cart however (among other things), is it’s very conversion focused. Not only does it use cart templates which are proven to turn as many of your leads into customers as possible, but it also offers tools to maximize the revenue you get from each customer. One such feature is the ‘order form bump’ which I will cover in more detail later. Spoiler: it’s made me a lot more money than when I didn’t use this feature! Other such features are one click up sales, split pay and subscription options, and many more. So that’s what Thrivecart is, let’s look at why it’s the best shopping cart choice for digital marketers in my opinion. So let’s start with the positives. While there are many reasons I like Thrivecart, here are the main ones. This feature alone is a huge one. Not sure what Order Form Bumps are? 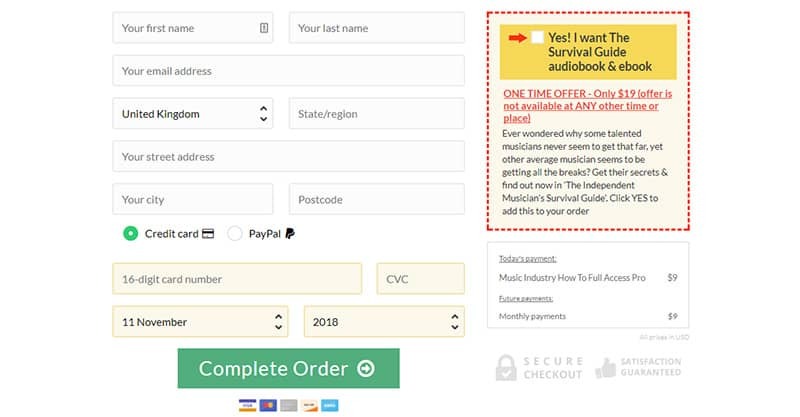 Well simply put, they’re a small checkbox on your order form where you can offer your customer an additional product, and they simply have to click the checkbox to add this offer to their order. Sounds simple right? Well this small checkbox has upped my average order value! In this box I offer a $19 product that I previously couldn’t sell at $9. It simply wasn’t getting any sales no matter the sale page and marketing angle I tried. But I more than doubled the price and added it as an order form bump, and now 15% of people who hit the shopping cart page also buy this by simply clicking the checkbox. Without seeing more than a few lines of text. And it doesn’t have any refunds at all, so people are happy with the product! I’m only scratching the surface with these bumps, I still need to test other products when I’ve created them, as well as price points. But I’ve seen enough already to know that these are a great way to up your income with very little effort. This feature alone has already brought in enough additional money that it’s already paid for the whole Thrivecart shopping cart for me. And that’s before the additional money I’ve made from other features and fees saved. One of the main reasons I switched over to Thrivecart was because how much money it saves me on fees. Before Thrivecart I was using Clickbank. While there are some things I like about them (namely that they handle VAT and EU VAT payments for me so I’ve less paperwork; I still use them for processing EU customers to this day), their fees are very expensive. For general product sales, they charge you 7.5% of the product price plus $1. So if you sell a product at $100, they’ll take $8.50 as their fee for you using their system leaving you with $91.50. For recurring products you sell through them under $40 a month, they take away 9.9%, leaving you with 90.1% of the rebill price. For example, for a $30 a month product, for each rebill they’d take away $2.97 each time. These may or may not sound like a lot to you, but believe me when I say that running a five figure per year business through Thrivecart can literally save you thousands of dollars on fees alone per year. This is because Thrivecart don’t take any fees from you. After you buy their shopping cart upfront, you only have to pay the fees of the payment processer you use. E.g. If you use PayPal, you’ll pay 2.9% of the product you sell plus $0.30. That’s more than a 61% saving over the percentage you pay over Clickbank, and a 70% saving on the fixed cost. 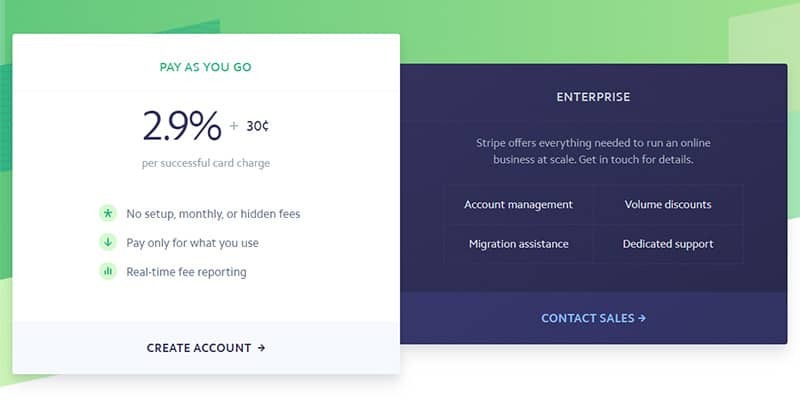 Stripe fees are the same as PayPal’s: 2.9% plus 30c (Note, additional fees may apply for international cards, depending on which country you’re using it from and where your customers are). So now you save big on fees with Thrivecart, let’s look at some real numbers. Let say you sold $20k worth of your digital product on Clickbank over a year (200 $100 products). In fees that’d cost you $1700 ($1500 as a percentage of your sales, and $200 in fixed fees). If on the other hand you done the same with Thrivecart, it would cost you $640 ($580 as a percentage of your sales, and $60 in fixed fees). In terms of fees, that’s a $1060 saving for every year you own Thrivecart if you’re making $20,000 per year. Much more if you’re making more than that! 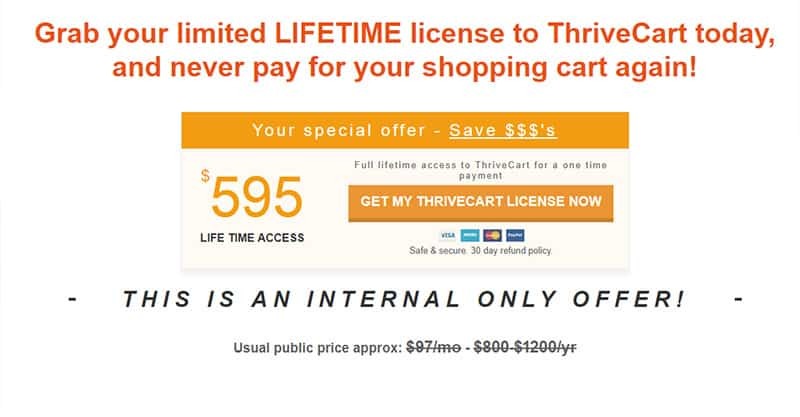 Of course, you will have to pay the one off $595 to buy Thrivecart. But even in that calculation you’d end up $465 in profit over Clickbank in the first year, and again $1060 for every year after that. More if you turn over more than $20k in the first year. Knowing I’d save so much in fees was a big reason for me to get on TC. Now this is a big one. At the time of writing this, you can get Thrivecart for a one off cost!! Considering its competitors both charge monthly, this is a big deal, and will save you big! As always, let’s look at the math. The two main strong competitors are SamCart (SC) and ClickFunnels (CF). All have similar features and are widely used, but the price is one of the ways where they hugely differ. Samcart costs $99 or $199 per month, depending on which subscription you get. They’ve also got a super stripped down $19 a month version, but that’s in no way comparable to Thrivecart and isn’t worth getting based on the limited features which they’ve included. 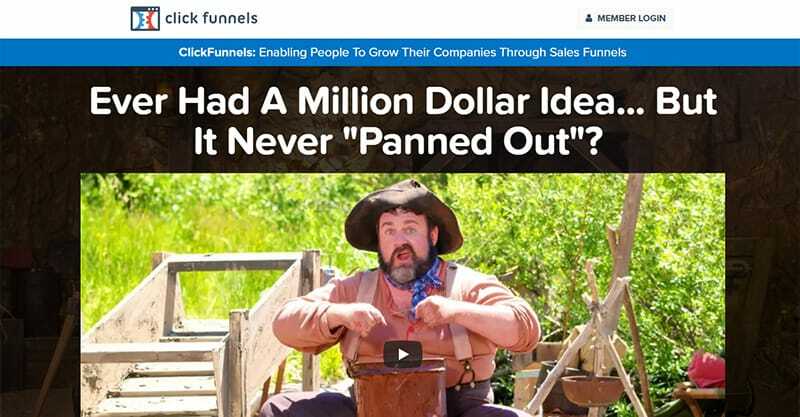 Clickfunnels costs $97 per month on the low end, and $297 per month if you get their additional features and want an unlimited amount of sales funnels. In comparison, Thrivecart charges a one off fee of $595. No monthly payments, this price is for lifetime access. They plan on changing this for new customers in future, so I’d recommending signing up asap if you know it’s the right cart for you. In comparison to the other carts though, at the low end offering of SamCart and Clickfunnels, 6 monthly payments in and you would’ve paid roughly the equivalent of buying a Thrivecart lifetime license. So every month after that, you’d be losing $97 / $99 a month just on cart fees. Over the course of the first year, ClickFunnels and SamCart will have cost you at least $569 more. On the second year and every year after, you’ll be paying at least $1164 per year more than if you used Thrivecart. Now, in reality, Thrivecart offers closer to what the premium versions of Samcart and ClickFunnels offer. And these cost a lot more. In comparison, the lifetime cost of Thrivecart will be the same as a 3 month SamCart subscription, and the same as a 2 month Clickfunnels subscription. 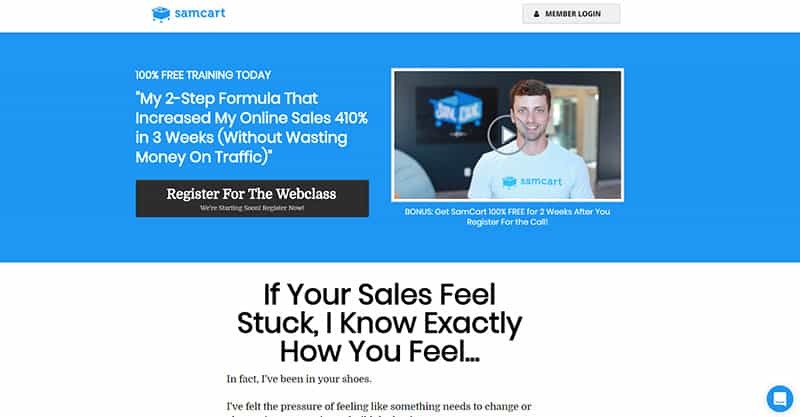 After that time is up, every year you’ll be paying $2388 more for SamCart than you would Thrivecart, or $3564 per year more for Clickfunnels than you would Thrivecart. Now I’m not saying cost is the only factor at play hear, you need to think about what each solution offers to see which is right for you. But considering Thrivecart does all the things I need and more, price did play a big part for me. One of the first things I noticed when I bought Thrivecart was how quick and easy it was to set products up. When with Clickbank, product set up was a real chore. To the point where setting up the same product to split test price often didn’t get done; it was too much of a hassle. 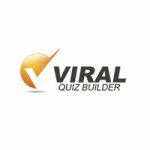 You’d have to not only fill in the details of the product on CB, but you’d also have to set it up in EasyClickMate as by default all of Clickbank’s products go to one landing page (and this complex tool allows you to have multiple landing pages). Aditionally, you’d have to submit your product to Clickbank for them to review, and they’d get back 3-5 working days later, usually to tell you need to change something and resubmit for another review. Overall, this was a very long process, and one which I gained a real phobia against. On the other hand, if I want to set up a product in Thrivecart, I can do so in a matter of minutes, rather than a week or so. As everything is in your control, there’s no review process. You simply tell the cart what you want as it guides you through the setup process and it’s done. Love it. I’ll be 100% honest with you, this is a feature I haven’t done much more than experiment with so far as I’m in the process of creating future products for my sales funnel. That said, I know this is a feature that I will be using as soon as these products are in place. What Thrivecart allows you to do is give customers to buy another product of yours in just one click after they’re bought one before. This is powerful because once someone is in the buying mindset, they’re more likely to keep buying more things. As long as your product can really benefit their lives, this is a win-win for everyone! 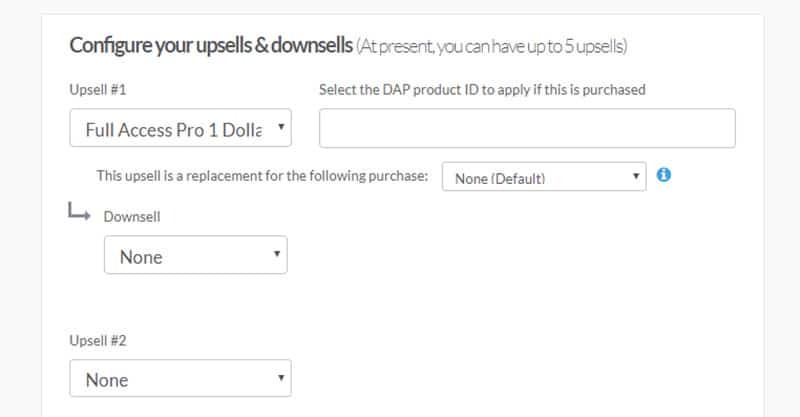 When they buy the second (or third) product from you, instead of them having to input their credit cart details again, the one click upsells allows them to simply click a button and have the card they inserted details for before be instantly charged. This speeds up the process, and allows the customer to go through the process with real ease. I’ve been on the other side of this transaction before. I’ve bought a product, been presented another, then bought in just one click. While you may not think having to manually enter your card details multiple times on the same website is much of a big deal, by having your customers do this you’re just entering a bigger barrier between them and the solution they want. And not everyone will be willing to do that, meaning you’ll make less sales per customer, and overall lower your average order value. This feature is a must have for maximizing profits. In all honesty, I haven’t even scratched the surface with using all the features myself. The affiliate center, the funnel builder, the product upgrades, the physical product shipping and more. I’ll definitely be exploring a lot more of these features once I have more products up for sale, and I’m sure they’ll help me jump my income even more than it has already. While I genuinely feel Thrivecart is currently the best shopping cart solution out there for those who are selling digital products, it’s not perfect. There have been a couple of things I’m not 100% happy with, both of which I’ll share with you below. My membership website on Music Industry How To is built on the Digital Access Pass software. I’ve thousands of free and paid members on there, so the software is pretty much locked into my business. That said, DAP and TC don’t full play nice together. 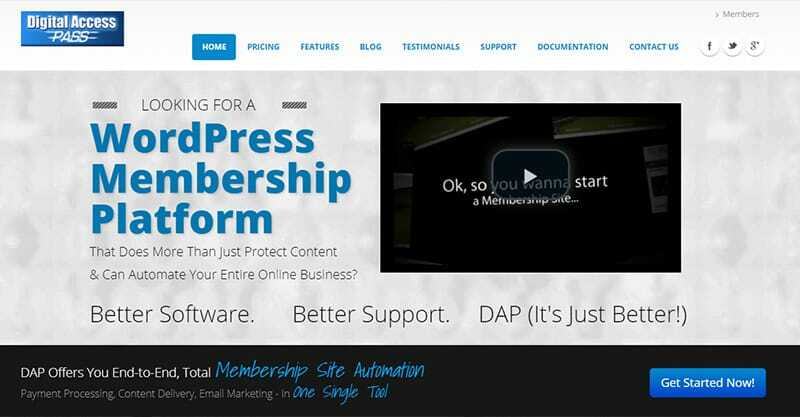 The main issue is the recurring membership payments. There are been a few issues I’ve uncovered with this, the main one being membership dates not automatically updating when payments are made. This has meant that I’ve had to update member’s dates manually each time they make a payment. This has now become a daily task for me. While this is far from ideal and a huge step back in terms of how it should be (members should automatically have their dates updated when their payments come through) it’s something I’ve had to live with. I can’t get rid of Digital Access Pass as it’s too integrated into my other systems. And I don’t want to get rid of Thrivecart as it makes me so much more money than other carts could. 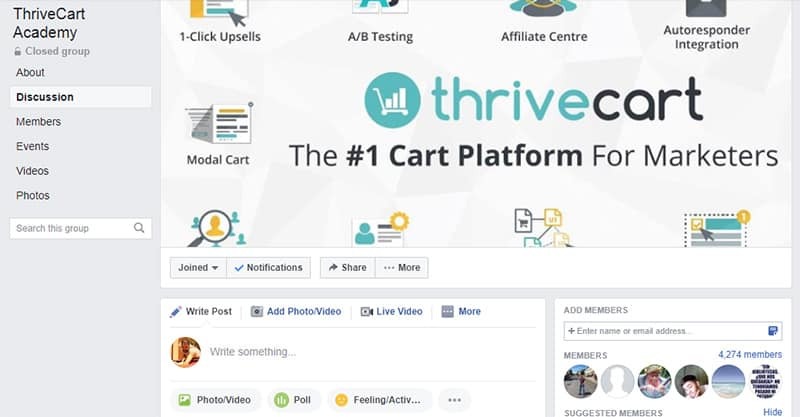 Furthermore, when looking into Thrivecart alternatives such as Samcart and Clickfunnels, it seems both of these also have some membership related issues. So the last thing I’d want to do it switch over to another cart, only to find it has bugs of it’s own which are even more of a headache to deal with and don’t have a quick and easy work around. I’ve approached Thrivecart support about this issue and they’re looking for a solution. So hopefully it’ll be fixed soon. As far as I can see though from others I know who run TC with other WordPress membership plugins, this issue only happens with using Digital Access Pass and Thrivecart together. So if you’re using Digital Access Pass for a recurring paid membership and was thinking about getting Thrivecart, you may want to look at other options too. Update January 2018: Their support center is now a lot more filled out with helpful text and video tutorials on how to use Thrivecart. It’s far from perfect, but I’ve been told they’re continually adding more guides over time. So this area of things will likely only get better. While Thrivecart is generally very easy to use, there are times where you’ll find you need to know how to do something and it isn’t immediately obvious how to do so. No problem, just go to their support center right? Well, maybe not. The thing is, while there are some tutorials there, they generally don’t cover more than just the basics. They have got a highly responsive support team and a very active Facebook page where you can ask questions and will get answers within the day. That said, it’d be nice to have somewhere you can go and self-serve your own answers instantly, rather than wait around for a reply. So how much does Thrivecart cost? At the time of writing this, it is possible to buy a lifetime license of the software for just $595. Yes, this is a one time payment. When you consider that other similar shopping carts are between $99 and $297 per month, this is by far the cheapest option if you plan to use your new shopping cart for more than a few months. This lifetime license is only available through select affiliate links such as this one. In fact, Thrivecart isn’t currently open to the general public if you don’t go through one of their recommended partners. I’m one of their recommended partners as I’ve extensively used their shopping cart and have turned over the required amount of transactions. So I can give you a tried and tested honest review of their product. The lifetime license however is due to be shut down very soon (if it’s not already by the time you read this), so be sure to get it while you can. 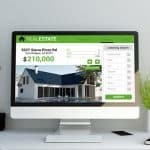 After that the monthly price is predicted to go up to between $99 and $199 per month, a price that will bring it up closer to the market price. 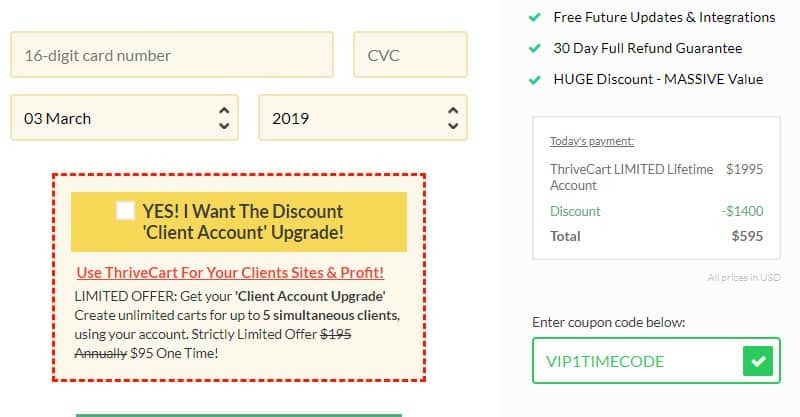 Thrivecart also offers you an optional extra at the checkout, the ‘client account’ upgrade at a reduced price of $95 (or $195 if you buy it later on). If you run more than one business or you have clients who you want to use Thrivecart for, this is an essential extra to add. I bought this upgrade and now use Thrivecart across two of my businesses with all of their settings being separate. For example, I can send emails from a different email address, keep track of how each business is doing through separate reports, and the like. 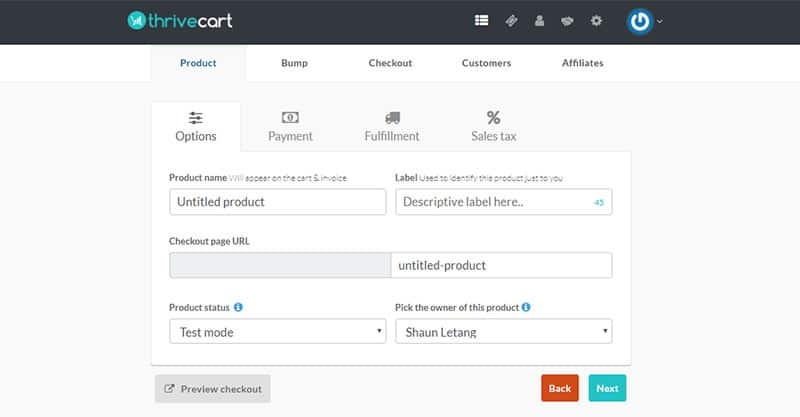 The first way is to create a ThriveCart order form page and have it hosted via the Thrivecart server. From there you can just link to it from your website in the same way you would any other link, and when someone clicks that link (likely placed on your product sales page) they will be taken to your shopping cart. The second option, and the one that I usually do, is to get the embed code from Thrivecart once you create your shopping cart. 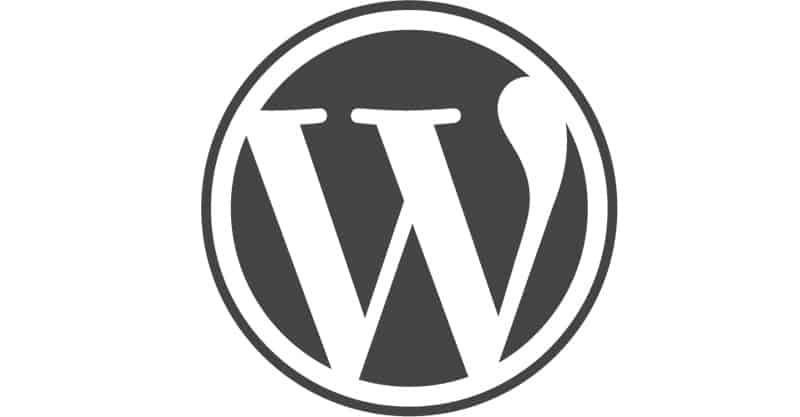 You can then simply paste this into the HTML editor in WordPress and your shopping cart will appear on your website page where you have inserted it. Now, I’m going to be 100% honest here. I haven’t owned SamCart or ClickFunnels before, although I’ve got friends who have them, and I’ve played around with them both before. I’ve also done a lot of research into it and I can tell you why I felt TC was a better option for me. Now don’t get me wrong, I can afford the top offerings of Samcart and Clickfunnels. I’ve always said that if a tool will help my business make more money, it makes sense to invest into it. And I strongly believe that. That said, I’ve always been a believer that if there’s a cheaper alternative to a tool which already does all the things I need, why pay more? This is the exact situation with Thrivecart, Clickfunnels and Samcart for me. They’re both built with pretty much the same features (in terms of the ones I’d personally use any way), but there’s one key difference: The price! While Thrivecart at the time of writing this is a one off fixed cost at $595, Samcart is a monthly subscription. For them to do everything which Thrivecart does, Samcart will cost you $199 per month. To do nearly everything they do without the affiliate center, it’ll cost $99 per month. They also have a $19 per month option, but based on the features you’ll need to maximize sales, it’s not really a tool I’d recommend. It can’t sell subscription, can’t do trials and more. It takes out some of the most important features, so can’t really be compared to Thrivecart. 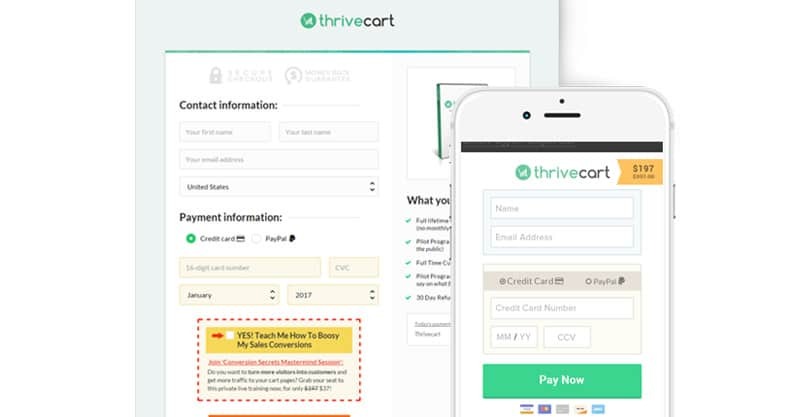 Now, at either the $99 or $199 version of Samcart, within 3 or 6 months of payments respectively, you will have paid the same as you will have for a Thrivecart one off fee. And in 5 years time? You will have paid a huge amount more on your shopping cart than if you’d simply paid a one off subscription upfront. The same is true with Clickfunnels, which cost $97 per month for their standard tier, and $297 per month for their premium tier. Unless you’ll only looking to run a business for a month or two (really?) then it’s a lot cheaper to pay upfront for your cart. I’ve been using them for over a year now, and in that time I’ve saved big just by saving money on my cart. In my opinion, as they all have the main features I need, the price is the biggest deciding factor between the three. You can save so much, for me Thrivecart was the obvious choice. That’s not to say Clickfunnels and Samcart aren’t good, or that they may not be a better fit for you personally. But if you’re asking for my recommendation based on my experience, what I’ve seen and the pricing, I’d say you’d do good with Thrive. Update March 26th 2018: I now no longer use Clickbank at all, even for my EU customers. I 100% use Thrivecart for worldwide sales. Ok, quick side note. While I use Thrivecart for my product sales outside the EU, I still use Clickbank for my sales in there. This is due to personal preference: as I’m from the UK, if my EU product sales go through Clickbank I don’t have to worry about filling in VAT Moss and VAT information. They do that on their side as they officially become the seller of the product. 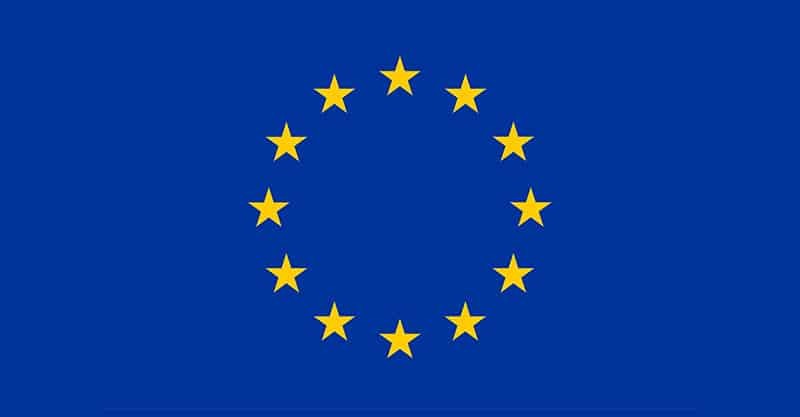 Thrivecart actually has a handy feature where they work out all UK and EU VAT for you, making reporting to these places easy. That said, for now I’ve opted to still use CB to minimize paperwork. This will change in future, as the big downside to this is that if affiliates promote my products, they won’t get any commissions for UK visitors. This isn’t fair, and as I want to run an affiliate program in future, I’ll be switching over fully to Thrivecart. In conclusion, I’d recommend Thrivecart to everyone looking to sell digital products. It’s not a magic bullet in the sense that if you’re not making any sales of your product you’ll suddenly start making them. You do need to have a good product people actually want after all. But as soon as you have that, TC will help you sell more of them, and make the setting up and whole process a lot easier! 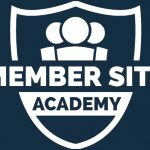 And if you’re looking for a proven way to build and grow your own membership website which you can sell via Thrivecart, check out my review of the Member Site Academy. This is a membership I’m personally part of, and one that has helped me grow my business greatly alongside Thrivecart. So, do you have any questions about this digital shopping cart solution? Ask away in the questions my friends, and I’ll see if I have the answers.